Notre Dame’s Tyler Speas looks for an open teammate. New Boston’s Kade Conley handles the rock up top. 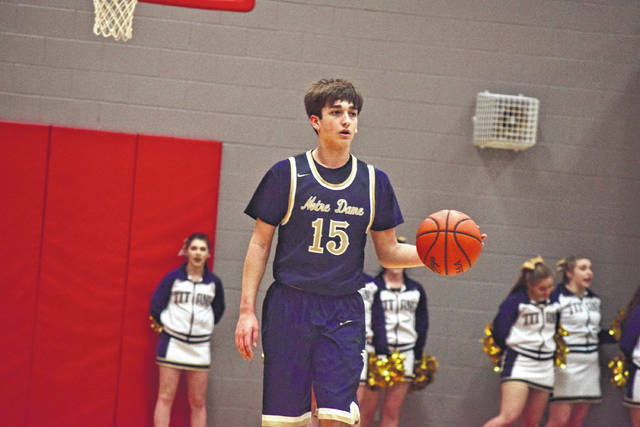 Notre Dame’s Jackson Clark put together another dazzling three-point display, sinking five treys en route to a game-high 17 points. New Boston’s Kyle McQuithy brings the ball up the floor for the Tigers. NEW BOSTON — Tight contests with tournament atmospheres are a great way for a pair of teams to get ready for the postseason. On Friday evening, the New Boston Tigers’ boys basketball program and the Notre Dame Titans’ boys basketball program were able to get some excellent late-game experience heading into the tournament as the two programs made their final SOC I and regular season bout count by dueling and battling it out over the full 32 minutes on Friday evening. However, when the dust settled, it was a pair of upperclassmen who ultimately turned the contest around. With New Boston down by a 37-33 margin to Notre Dame over the final 40 seconds of the third quarter, senior Drake Truitt stepped up in a major way for his Tigers as Truitt — who didn’t play until the last 40 seconds of the frame — made two filthy no-look passes to Alex Meade to allow New Boston to take a 39-37 lead at the end of the third quarter. A fourth-quarter trey from Tyler Caldwell and a quartet of free throws between Kade Conley and Kyle McQuithy then allowed New Boston to hold off a strong effort by Notre Dame as the latter trio all finished in double-figures en route to giving the Tigers a 51-46 victory over the Titans at Glenwood High School in New Boston on Senior Night. For Adam Cox, a win — especially over a Notre Dame team that is peaking at the right time — always makes for a great result. As for Garrick Anderson, the second-year head coach was again impressed through and through, especially with his team’s maturity in opening up a 17-7 lead to start the game, and again when Notre Dame rallied back from a 26-20 deficit to grab leads of 33-28 and 37-33 in the third quarter of play. From the outset, Notre Dame used its patience and sound execution on the offensive end to keep New Boston on its heels throughout the opening quarter of play. While both teams suffered through a long scoring drought before Conley scored at the 3:48 mark of the first to open the contest, Notre Dame’s Tyler Speas answered with a bucket 19 seconds later to tie the game at two apiece, and behind another low-post basket from Speas and a banked-in three-pointer from Cole Harrell, Notre Dame ultimately took a 9-4 advantage at the end of the frame. Speas, who proved to be a force down low all game with his crafty play, leadership, and finishing ability around the rim, ultimately finished with 10 points for the contest — and six in the first half — as the Titans took a 17-7 lead, its largest of the contest, with 3:45 to go in the first half of action. The second quality — his leadership — was huge for a Notre Dame team that only allowed two field goals in the opening quarter of play to a team that has put as many as five scorers in double-figures in a game this year. However, as the half wound down, New Boston’s talent began to show as the Tigers’ depth and experience began to wear on the Titans. After a Conley layup with 3:03 to go, Caldwell followed by knocking a three home with 1:57 to play to kickstart a massive 15-3 spurt. The Tigers, who scored 12 of those 15 points over the latter timeframe, scored on three consecutive possessions in a matter of 25.8 seconds to storm in front at the halftime break, 22-20, as a second Caldwell trey was followed by a block and a layup by Kade Conley and a steal and a layup by Caldwell with 1.8 seconds to go gave New Boston its first lead since the Tigers’ 2-0 lead to start the affair. Caldwell ultimately scored eight of his team-high 13 points in the second quarter of action. However, after Kyle Sexton and Eddie Phipps scored to extend New Boston’s run to a 19-3 margin, the young Notre Dame squad proceeded to battle its way right back into the fray — thanks to the three-point shooting of Jackson Clark. Clark, who has been tremendous from beyond the arc throughout the second half of the year as evidenced by his nine three-pointers and 34 points against Western, along with his five three-pointers in a big victory over Ironton St. Joseph, again put on a dazzling display from three-point range by answering buckets from Phipps, Conley, and McQuithy each time with a three-point basket. The freshman’s third trey in the chain ultimately proved to be too much for New Boston to hold back as Cole Harrell followed Clark’s explosion with a jumper from 10 feet out in the middle of the lane to tie the score at 33 apiece, while Ben Mader and Miles Shipp each obtained baskets off of excellent defensive plays to allow Notre Dame to go on a 9-0 run as the Titans took a 37-33 lead with 1:56 to go off of Shipp’s steal and finish on the other end. Clark, who finished with a game-high 17 points for the affair, finished with five threes again to prove why the freshman is quickly rising up the charts as one of the very best three-point marksmen in the Tri-State Area. But with the game hanging in the balance, it was Truitt who made the game-changing plays. After Kade Conley — who scored on the previous possession — twisted his ankle on the defensive end and came up hobbling toward the end of the third quarter, Truitt was inserted into the contest for the first time as the steady senior went out for six minutes with the injury. The former, however, responded when New Boston needed him the most by making two no-look passes to Meade down low that allowed the Tigers to take the lead with a 6-0 push at the end of the quarter. Truitt continued to provide a much-needed boost of fresh blood to a New Boston team that was simply gassed. With the ball back in its court, New Boston used the energy of Truitt and Meade to create opportunities for others. 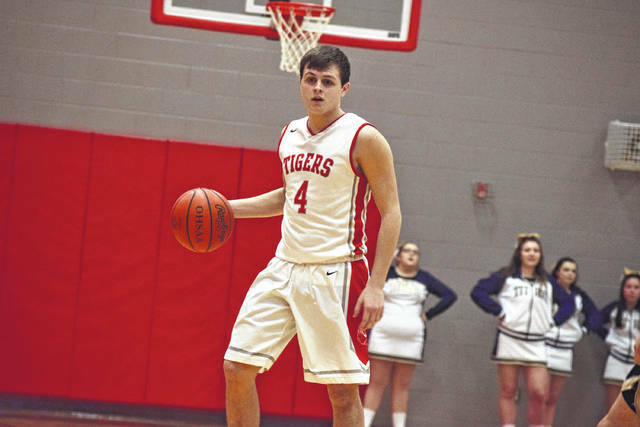 In the fourth quarter, McQuithy — who scored seven of his 10 points in the first half — and Caldwell ultimately capped off an 11-0 push as the former’s layup and the latter’s three-pointer with 5:04 to go gave the Tigers their largest lead of the affair. Speas and Mader answered with five straight — with the latter’s three cutting the New Boston lead to two — but Conley, McQuithy, and New Boston closed the deal by nailing five of their seven free throws from the charity stripe to stay one step ahead all the way to the finish line. Conley gutted out his sprained ankle, and the flu, to obtain 12 big points for the Tigers for his trouble. 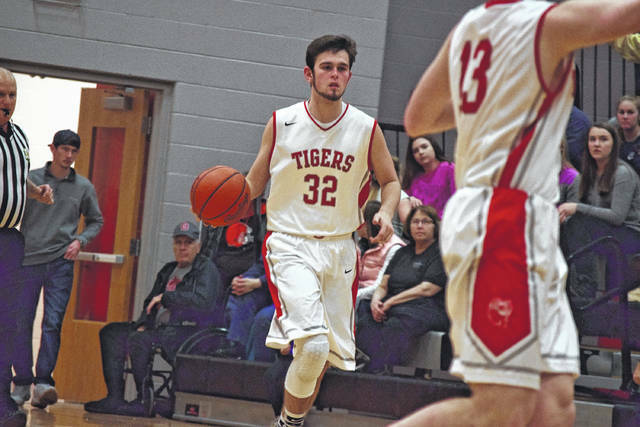 For New Boston, the Tigers — who now sit at 15-7 on the season and finished 11-3 in SOC I play in the process — will turn its attention to a Division IV Sectional Final affair at Northwest High School on Wednesday, Feb. 28. There, the No. 3-seeded Tigers will play either No. 6 Leesburg Fairfield or No. 11 Clay at 8 p.m.
For now, however, Cox is just happy that his seniors got to sew up a 15-win season for themselves and for their community. As for Notre Dame, the Titans, who finished the year with a 3-18 record and a 2-12 SOC I showing, look to be hitting their stride at the right time. 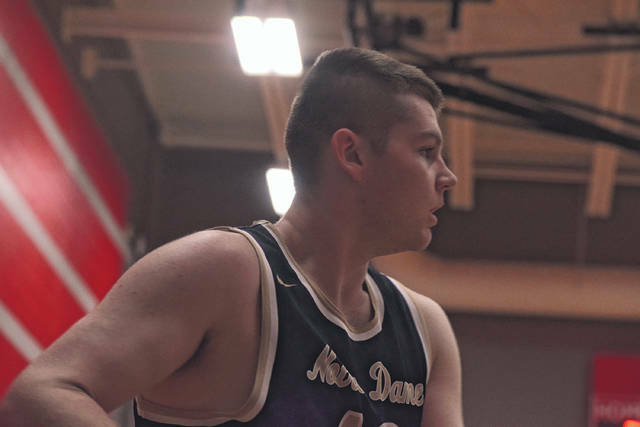 Two big one-point wins over Ironton St. Joseph and East, along with a tight two-point loss to Western in overtime and a four-point loss to New Boston during four of its five affairs, have the Notre Dame faithful excited for what is to come. However, Anderson says that the Titans must force on No. 8 Manchester — in a showdown that will take place on Tuesday — before anything else can be discussed.